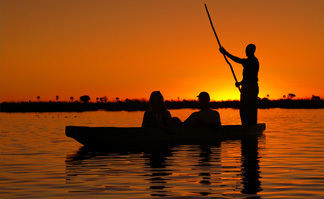 The Okavango delta is undoubtedly the most precious intermixing of desert and marsh flora and fauna which is a unique habitat. Tourists throng here to experience this amazing theater of activities. Proposed itinerary: The dates are flexible between 01 April to end May 2016. Price will remain valid for a minimum of two adults traveling together and the availability has to be checked on receiving your interest. Take flight from Mumbai to Livingstone on Kenya Airways. On arrival in Livingstone you will be met and transferred to Ilala Lodge. A boutique property near the town and easily accessible to the falls. You have rest of the day at leisure. You have the helicopter ride over the falls, followed by walking tour of the falls. Rest of the day at leisure. You will be met and transferred to the border with Botswana. Cross over to Botswana and drive to Chobe game reserve. It is known for huge elephant herds and the landscape. You will check into Chobe Under Canvas Lodge. After lunch proceed for a game ride. Dinner on arrival. Today after breakfast you will check out and transfer to the airstrip for the scheduled flight to Moremi. Transfer to the Khwai tented camp in the conservation area. Today after breakfast you will check out and transfer to the airstrip for the scheduled flight to Okavango. You will check in Pelo Camp. You have morning and afternoon activities in the reserve. Stay with all meals included. After breakfast you will check out and fly to Maun by scheduled flight. On arrival take flight to Gaborone. On arrival in Gaborone transfer to hotel for overnight stay. Transfer to airport for check in for your Kenya Airways flight to Mumbai via Nairobi. The above is a standard package with cost valid for minimum 2 participants on twin share basis.